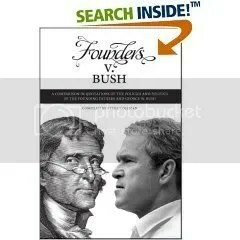 A Review: Founders v. Bush: A Comparison in Quotations of the Policies and Politics of the Founding Fathers and George W. Bush, Steve Coffman, One World Studios, Ltd., Los Angeles, CA, 2007. An insulted, but calm Thomas Jefferson looks out to the reader from the cover of Coffman’s book and away from a petulant, pugnacious George W. Bush. I didn’t have to open the book to know how the comparison would play out, but I’m glad I did. Coffman provides a good review of the first six years of the Bush Administration in their own words organized by topic: the Constitution, the Bill of Rights, war, peace, religion, lies, honesty, and disinformation among others. Juxtaposed to these quotations are relevant words of some of America’s founders. When the founders’ words do not directly contradict those of the Bush administration, they warn strongly against allowing such people as these to acquire power. The founders’ words provide the reader with material for a more than adequate rebuttal to claims that this administration and other Republican federal officeholders are faithfully following the principles and intent of the founders. Many of the Republican claims come wrapped in intellectual dishonesty and falsehood which makes it vital that the rebuttal be carefully and accurately sourced. Unfortunately, sourcing is the greatest weakness of Coffman’s book. Contrary to the claims on the rear cover “fully sourced,” and in the introduction, “In this book all of the quotes (sic) have been sourced, sources provided, and, as far as feasible, provided in ample context,” the sourcing ranged from full, to frustrating to verify, to intellectually suspect. The Jefferson quotations are not necessarily easily found using Coffman’s sourcing. The “Online” sources at the end of the book include only The Works of Thomas Jefferson, Federal Edition. The Memorial Edition is not to be found in either the “Principle Sources” or “Online” sources, but some of the quotations in the text are sourced to the Memorial Edition. This wouldn’t be a problem if one could safely assume that quotations not sourced specifically to the Memorial Edition were from the Federal Edition. Unfortunately, that’s not true. On page 53, for example, one quotation is sourced, “Letter to Moses Robinson, 1801.” Searching the Federal Edition for either the exact quotation or “Moses Robinson” yields no hits. The quotation can be found in the Memorial Edition, Volume 10, Page 237 (ME 10:237). Too, some of the quotations not sourced to the Memorial Edition can be found in the Federal Edition. While in many cases I can remember Bush and members of his administration making statements like those Coffman reports, I could not verify all that I tried to check. Several of those ascribed to Bush only by date could be found by thoughtfully searching at http://www.whitehouse.gov, but I doubt the next owner will leave these up. At the end of the book are two listings: “Principal Sources” and “Online.” The web-savvy reader will be immediately perplexed to see that the “Online” list contains no URLs, no web page identifiers to type into a browser in order to get directly to the source. By googling the item in the author’s listing and searching through the first five or so candidates, I was able to confirm what I thought the author meant in most cases, though this sometimes meant deciding that one or all of the returned hits were meant. I could not find one of these sources no matter what I tried. As for the “Principal Sources,” there are only two books in the list which have the members of the Bush Administration as subject matter: Bob Woodward’s Bush at War and Ron Suskind’s One Percent Doctrine. I’m certain that these are not the sources for the vast majority of the vaguely-sourced quotations. This entry was posted on Saturday, October 6th, 2007 at 7:26 am and is filed under Uncategorized. You can follow any responses to this entry through the RSS 2.0 feed. Responses are currently closed, but you can trackback from your own site.